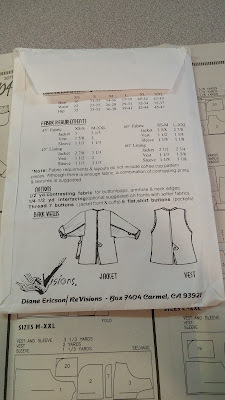 When I first started sewing seriously I tried out a Revisions pattern and it was awful. Then recently, the bohemian artwork sucked me in again. How quickly we forget and it is a good thing I think in some instances. 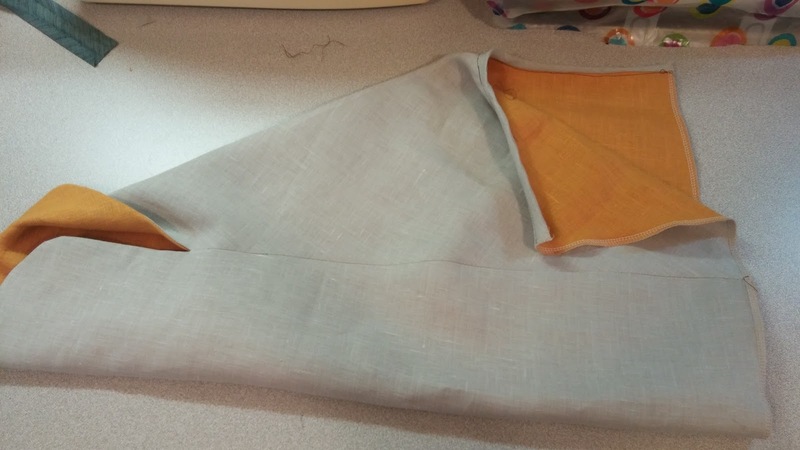 This pattern allows for lots of different fabrics or patterns to be used. Such a great way to move leftover fabric pieces up creatively! Anyway, I spent just about 3 days of sewing this one up. This is a very fussy precise pattern. None of the steps are hard, there is a just a lot of them and truly, it is best they are followed as written. I actually love this one, against all odds. 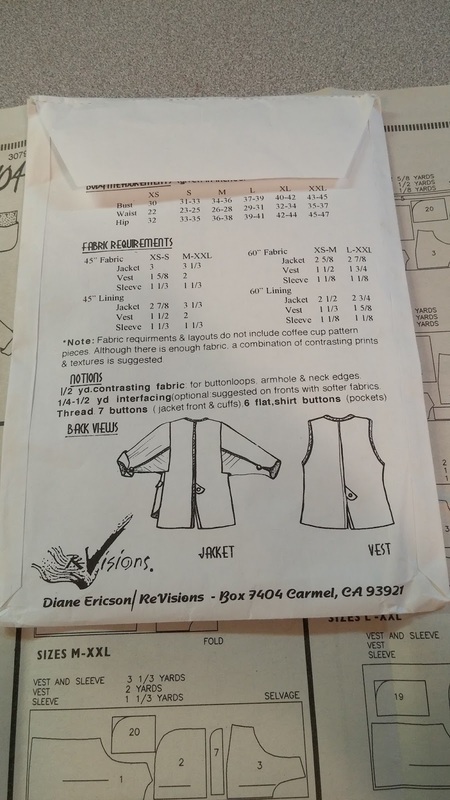 I'm not fond of overly fussy patterns, I certainly have had bad experiences with the drafting on the previous pattern and oh, I hate doing button loops almost as much as button holes, but the sleeve is sublime. 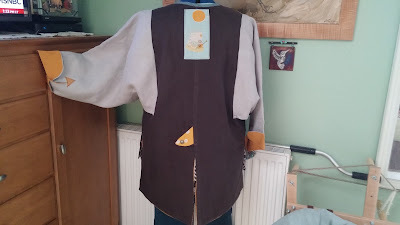 You basically make a vest, (a fully lined vest), finish with a bound armhole and then attache the sleeve which is also bound on the underarm section. 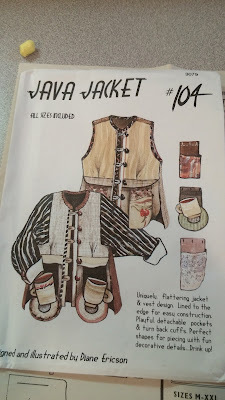 I will make this pattern again with just a couple of changes. 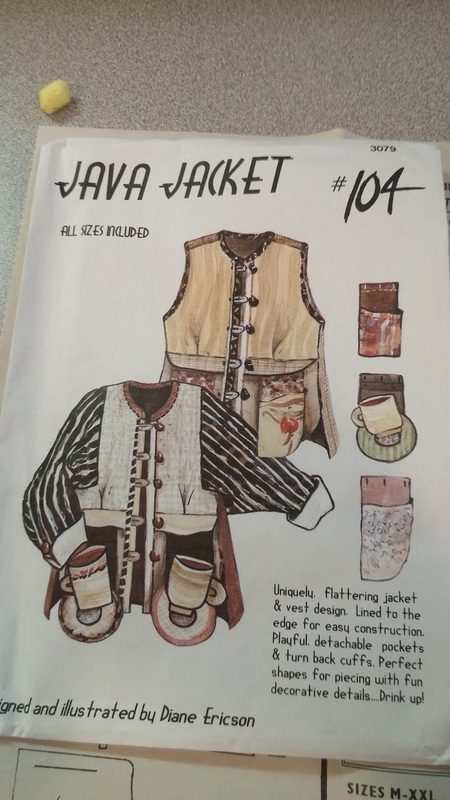 I would like the neck higher and I might add a hood, the sides on the back to mimic the front side curves and go down a size on top but still grade out to the larger size over the hips. I did not do the pockets as loose bags. I've done those before and they are just kind of a pain getting caught on everything. I'm also getting ready to start a new winter coat. This is my muse but it won't be exactly like this coat of course. 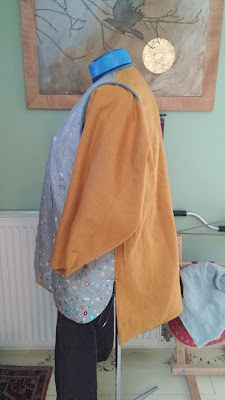 The shape and the hood appealed to me but I wanted my coat to be a raglan sleeve and I'm changing the pockets I think. A lot of design choices will happen on the cutting table for this one. I have assembled some lovely dark green wool, a taupe organic cotton fleece interlining and some "like the real thing" faux fur. 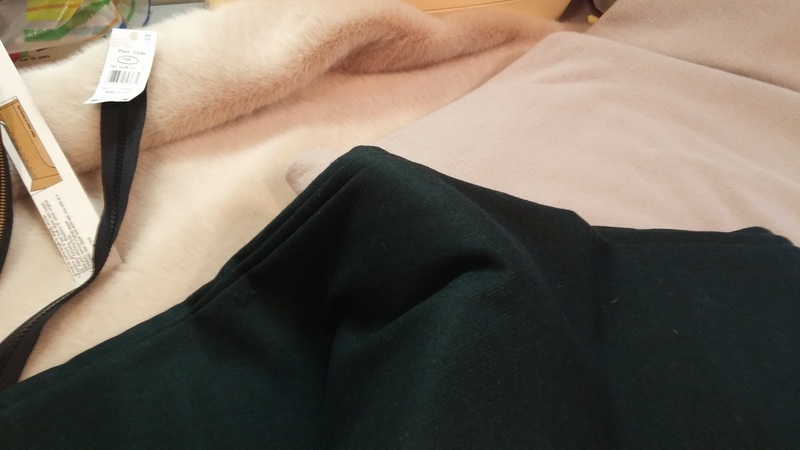 It's champagne sable and it is soft as any mink or sheared sable I've ever felt and it will be the hood lining. It will be hitting the cutting table this weekend and on to the sewing machine next week. 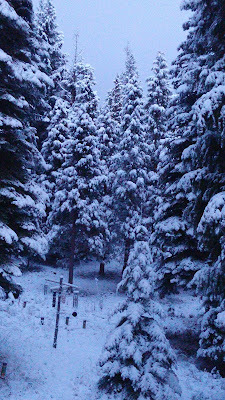 We had some snow here last weekend and it certainly put a damper on our super moon. 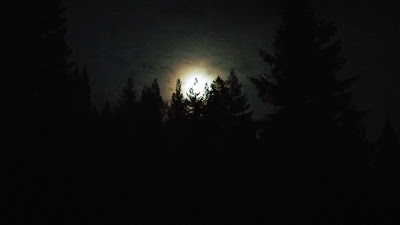 It was rather super but my camera skills are not. This is what it looked like as it rose with the fog around it. For all my animal loving friends and followers, I give you this amazing bit of advocacy reminding us that pets aren't just for the holidays but for life. I'm leaving you with Gary Jules doing Mad World. It is isn't it? 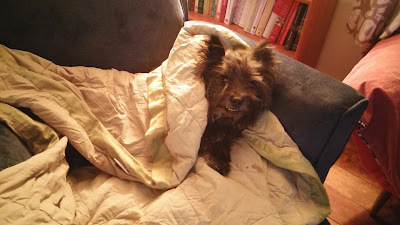 Parting shot: Smoochie recuperating after major dental surgery this past Tuesday. I so enjoy your thoughts and comments. Smoochie has the right idea: snuggle down!!!! Sorry about the dental surgery, though. What an interesting pattern...and you've worked it up in a lively way! 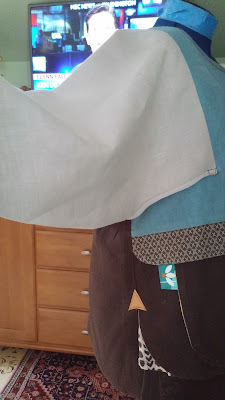 Isn't it fun to mix & match fabrics that you have already!!!! BTW, I agree about those floppy pockets. Who thought that was a good idea??!! Your jacket turned out great! 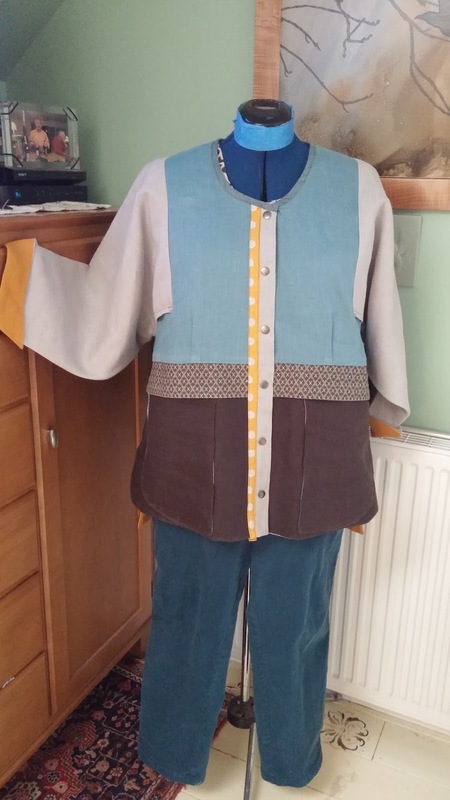 I tried that pattern many years ago, and did not like the fit, the neck was way too low for me among other things, and I didn't feel like trying it again. Looking forward to seeing the new hooded jacket you are working on, the fabric looks luscious! I feel for you (and with you), Smoochie! Jack just had major dental surgery himself. 14 teeth removed! YIKES!!! He's only 5. I feel horrible. Smoochie, hope your little smile is feeling much better! Love the dark green wool, very pretty. Martha, The Smooch man is feeling much better and is enjoying his daily pampering. Peg, I'm betting your wallet is feeling about like my wallet is this season. I'm sure Jack must be feeling better after getting those infected teeth out. Michelle, I'm betting you do. Hope the dental stuff is done soon. Cindie, It was a bugger to make but I'm pretty smitten with the pattern for using up leftovers. Anna H, It would be a nightmare to do any real adjustments to this pattern, but raising the neckline (maybe even a little stand up collar) and doing some grading possible. hence the name (he started life as Dante here). Loose pockets make me look like I have an extra set of saddle bags! Love that ad. It is so true. I am in total awe of your sewing skills and downright bravery. If I attempt a pattern, I stick to it like white on rice. Ah, little Smootchie. Dental work is so traumatic. For all of us. Your top (jacket?) is phenomenal! I love the colors and the mix of prints. 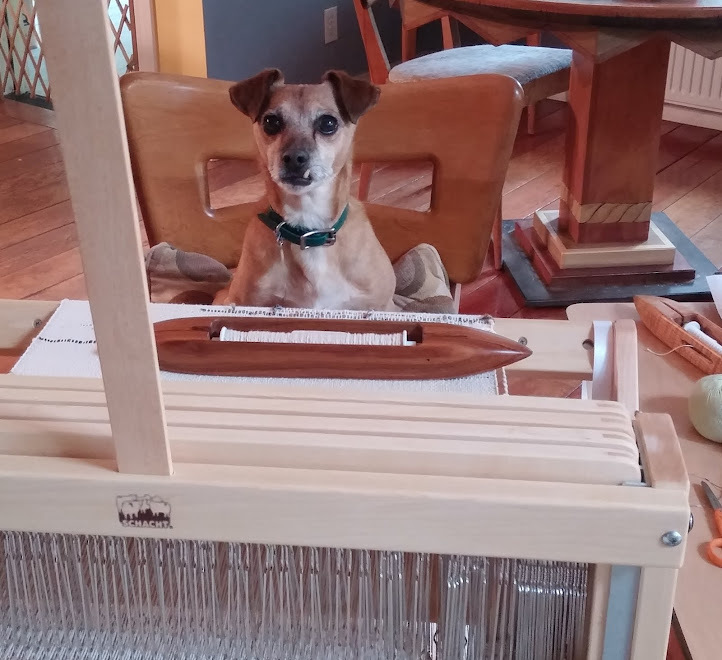 Every time I see you whipping up something I want to sew. Love the colors in the jacket.